You know his face from Top Chef. Now it’s time to get to know his food. And let me start with this: it’s good. Really good. 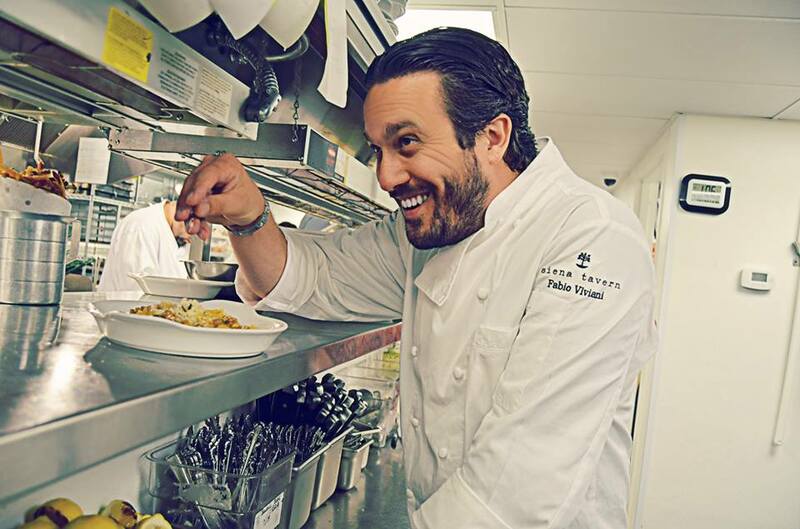 Fabio Viviani opened Siena Tavern in the spring of 2013 after this fan-favorite from season 5 of the hit TV show took a trip to his native country with restaurant proprietors Lucas Stoff and David Rekhson. The men fell in love with the open-kitchen style of a local restaurant and replicated the charm and cuisine in the heart of River North. The menu features a made-from-scratch theme, true to the rustic Italian theme they are going for. Siena Tavern joins the ranks of other Italian hot-spots such as Balena, Nellcote, and J. Rocco by handmaking their pasta selections as well. I must admit, this trend of moving away from boxed pastas is one I am more than happy to see (and taste). 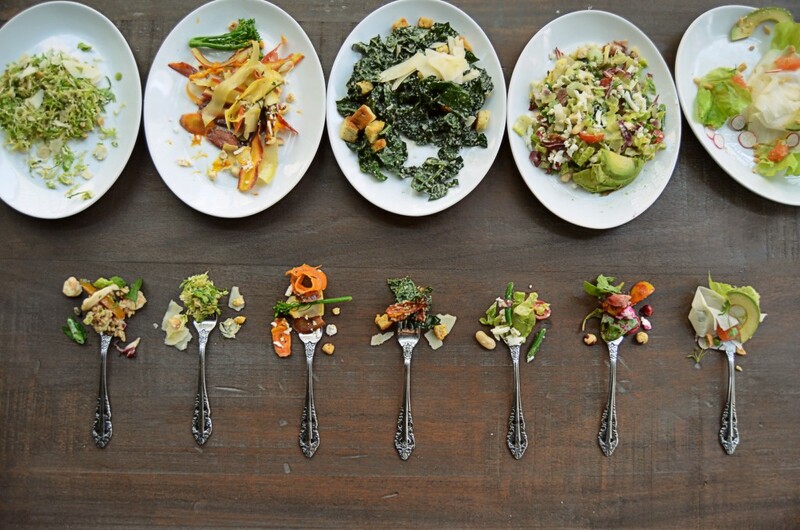 Standouts include their Siena Chopped salad. With 14 different ingredients, I was worried it would be a flavor mosh-pit, but everything ended up playing nicely together; a true testament of Viviani’s palette. 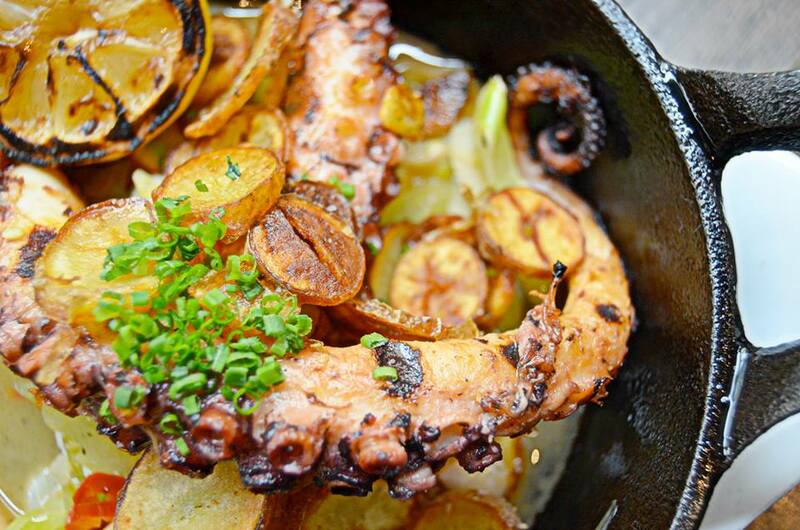 I also began my meal with the Grilled Octopus, which was served in a small cast-iron pan along with duck fat potatoes. The texture of the octopus was perfect, and pairing it with scalloped duck-fat potatoes was genius. Moving on to the pastas, it was hard to ignore a menu item entitled “Pasta In A Jar.” So I ordered it and guess what? 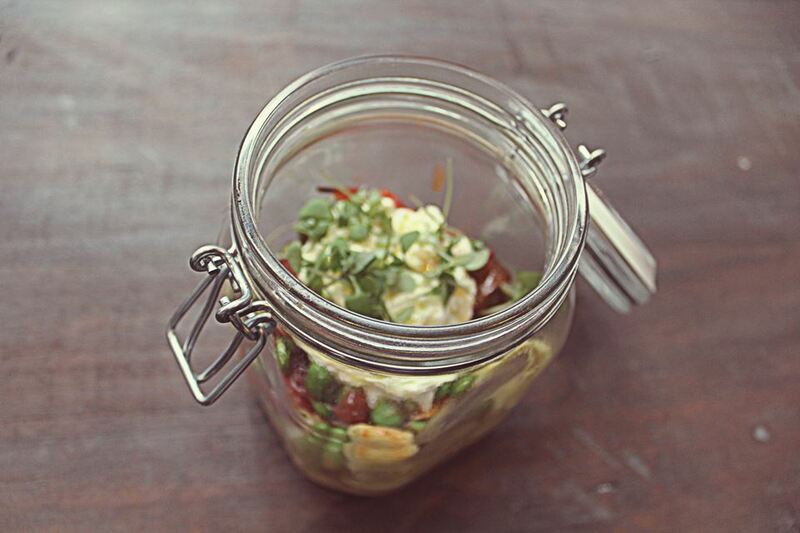 It is just that: a jar full of pasta (among other goodies). Layered in an air-tight canister, the waiter brings the stack of rigatone, heirloom tomato, English pea, bellwether ricotta, basil and olive oil. He give it a good shake and pours the contents onto a plate in front of you, so you are immediately greeted by the steaming aroma of delicious Italian cooking. My only qualm was that by jarring the freshly cooked, piping hot pasta, it seemed to have overcooked the noodles just slightly; as they were somewhat soft as compared to al dente. Pizzas are paper thin (cook in less than 5 minutes) with a flavorful sauce. The burnt pepperoni has a kick to it for those who can handle spice and the prosciutto fig was as decadent as a dessert. The menu also features a mozzarella and crudo bar as well, and a range of composed entrées including a 12-hour braised ossobuco and a 36ox. Aged porterhouse for two. For dessert, don’t skip Viaian’s signature dessert, his bomboloni – Italian donuts served hot in a paper bag on a plate with three sauces: whiskey-caramel, chocolate hazelnut, and raspberry chianti. They are the definition of addictive and a great way to wrap the meal. 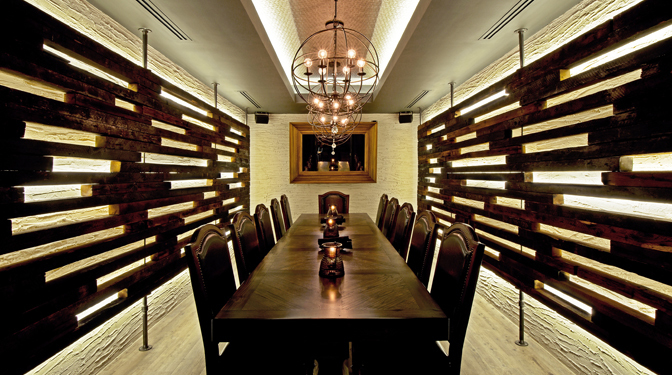 The restaurant caters to diners and nightlife patrons, so the place has a more lively – versus intimate – feel to it. 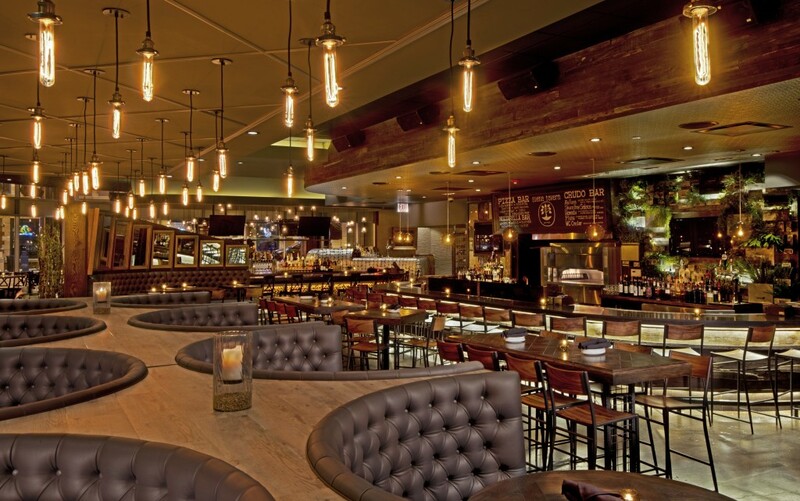 There are several styles of seating, including bar, crudo bar, booth, and private dining. Siena Tavern is open for lunch, dinner, and brunch. They offer a gluten free menu and have a robust wine and beverage list. Ideally I would love to see more by-the-glass options when it comes to the wine selections, but you can’t go wrong with one of their 15 cocktails. Reservations, especially on the weekends, are encouraged.